3Helsinki University of Technology, Institute of Industrial Automation. Figs. 1. Human (HeLa, cell line) chromosome, low-pass filtered to 20 nm. Figs. 2. DNA-depleted human (HeLa, cell line) chromosome, low-pass filtered to 20 nm. Fig. 3. Solid-3D-model of a tomography of a DNA-depleted human (HeLa, cell line) chromosome (Fig. 2). Fig. 4. Uukuniemi virus (Bunyaviridae), low-pass filtered to 3 nm. Also two fiducial gold markers, colored red, can be seen in the lower right corner. The virus is a close relative to Puumala virus that causes nephropatia epidemica in Finland. Fig. 5. 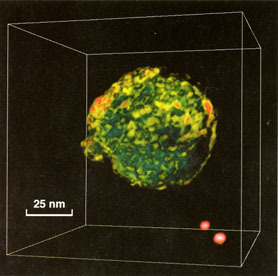 Single-shelled particle of simian rotavirus (Reoviridae), low-pass filtered to 3 nm. A human equivalent causes diarrhea world wide. Fig. 6. Immature HIV, human immunodeficiency virus (Retroviridae), low-pass filtered to 6 nm. An electron microscope is a structure projector of 3D-data. The theoretical resolution of a transmission electron microscope (EM) is at 100 kV, 0.002 nm, that is far below atomic resolution, deduced by Prince Louis de Broglie (1926) from his description of the wavelength of electrons (lamda= h/mv). The practical resolving power of most modern electron microscope is, at best, 0.1 nm (1Å). The picture of thick specimens is, however, superimposed, due to a high depth of field, on photographic plates. In stereo-pairs the resolution and the interpretation of structures are significantly improved. In a more modern approach a complete 3-dimensional view of the actual structures of microscopic matter is now available through electron tomography . In autumn of 1993 the first electron microscopy tomographies (EMT) of chromosomes and viruses could be shown and used in Finland. This was done at CSC by one of the authors (PE) who had obtained the EMT-programs from docent Ulf Skoglund's laboratory at the Karolinska Institute in Stockholm, after a half year training in using their EMT-kit . Our main efforts have been the further development of the performance of the Swedish-EMT by introducing stereo-animation of the aligned tilts at high resolution and sequences of the final volume around the tilt axis with the capacities for interpolation, magnification and measurement. All these features improve the visualization and interpretation of the reconstructions significantly. We will not go into all the details of how to prepare the material for an electron microscopy study. This is beyond the scope of this article. Many conventional EM-preparation techniques for both thin-sections and for whole-mounts can be used. It is for the individual investigator to decide how well the 3D-information is preserved with various techniques. In our opinion the whole-mounts are preferably critical-point-dried or alternatively preserved in some other way, like sublimation from solidified t-butanol in vacuum , to avoid shrinking. Also thin-sections are known to suffer from uncompromised shrinking . In addition, the whole object is not necessary completely included in a single section that may or may not be an advantage. In our studies of chromosomes and viruses with the EMT we have found that there is no consensus how to preserve chromosome  or virus 3D-structure. Though numerous whole-mount-techniques have been used in chromosome research, only some, less conventional, seem to be more suitable for 3D-studies . However, the most well established whole-mount-techniques used to study viruses, like the negative staining technique, have turned out to be insufficient. According to our EMT studies, viruses are flattened to 50 % with negative staining. The field is open for searching new and better 3D-preservation-techniques for viruses. Recently, after a systematic study of this problem, we finally found some new and promising methods. The new methods reveal similar delicate details like the negative staining method - used as a good criterion - but avoids the shrinking problem. What we learn from virus 3D-preservation studies can probably be used for other biological material as well. This is partly the reason why we use certain virus preparations as testing models in our EMT studies. Moreover, some viruses have distinctive subunits or other decorations in their shell that are of help as means of verifying successful 3D-reconstructions. Obviously, increasing the number of projections improves the resolution of the reconstruction. In practice, it will be difficult to manually take tilt-series with smaller increment than 3 degrees, which have become a standard for us, without observing electron radiation damage to the specimen. A goniometer in a normal electron microscope can only span from +60 to -60 degrees that results in 41 pictures (N = 60), with a 3 degree increment. This procedure takes 1 to 2 hours to complete and we have recognized practically no radiation damage in magnification up to 58000x in e.g. whole-mounted preparations of viruses. In magnification of 100000x serious degradation of the specimen can be observed of whole-mounted chromatin-fibers and viruses. Automating such procedures would overcome this problem. Automation has recently been introduced [7-9] but concerns modern electron microscopes that can be computer controlled. However, no such microscopes are available in Finland. Lower magnifications of specimens are preferable over very high magnifications not only because of danger for radiation damage to the specimen but also because of focusing problems. At very high tilts only the middle part along the tilt-axis will be in focus, the rest will either be over- or under-focused. This is because of the limit in depth of focus of ordinary (100 kV) electron microscopes. The lower magnification can partly be compensated by scanning the pictures with smaller raster size as the resolution of electron microscope pictures is very high even at low magnification. The flatbed scanner (Umax, UC630) at CSC has a maximum raster size of about 50 mm that corresponds to a 1 nm size of the pixel at a 50000x magnification. This usually exceeds the resolution obtained for a reconstruction according to Crowther-DeRosier-Klug formula (above). Nevertheless, there is a rule of thumb that says that the size of the pixel should exceed the visible resolution at least 4x. With the above settings we cannot presumably get better resolution than about 4 nm for a reconstruction of a chromatin fiber or virus, for instance. Apparently we will not see e.g. a DNA strand, diameter of 2.5 nm. A simple solution, but a laborious roundabout to secure a better resolution in the scanning procedure, is to make prints. with e.g. 3x magnification of the (41) negatives. We have recently tested this in tomographies of viruses with excellent results and finished with an improved reconstruction that could be low-pass filtered down to 3 nm. After the scanning of micrographs the resulting pictures must be aligned with respect to one another. Scaling, rotations, and translation of origin have all to be checked because of the variations in them from one picture to another introduced by the manual microscopy and scanning. This gives a set of over determined nonlinear equations that can be solved, for example, by conjugate gradient method. The aligning is done using fiducial gold particles placed on the grid before the microscopy. The particle coordinates in each picture must be picked interactively. Having completed the alignment, the pictures are ready for the actual reconstruction. The reconstruction can be done in 2D-slices which are placed on top of each other to form the final volume. The usual reconstruction method, which we have implemented ourselves, and which the Swedish-EMT kit uses, is the weighted back-projection method (for references see ). The weighted back-projection is done by first Fourier transforming a line from each projection (i.e. the micrographs) corresponding to specific z-coordinate (along the tilt axis), weighting them by |w|, (w being the spatial frequency), inverse transforming, and backprojecting (a point in the projection with tilt Ø corresponds to points (x, y) for which t = x cosØ + y sinØ , t being the coordinate along the line in the projection). Presumably better reconstructions could be achieved using e.g., maximum entropy method, or reconstructing from estimated orthogonal moments of the images. BOB (stands for Bricks Of Bytes): The program is freely available from Graphics and Visualization Laboratory of the University of Minnesota Army High Performance Computing Research Center. BOB is an interactive volume rendered for Silicon Graphics machines that uses alpha blending. The reconstructions are visualized in BOB as translucent objects composed of voxels of different densities. In gray-scale the volume is practically indistinguishable from the original EM pictures. With BOB every voxel can be visualized in different translucent colors and intensities, which clearly improves the visualization furthermore. BOB uses also stereo-visualization of the volumes and many more features of special advantage for the 3D rendering of very big volumes. FUNCS is the program we use for making promulgations of the volumes with finest resolution. This program has been developed by one of the authors (JR). The advantages in FUNCS are e.g. the incorporation of lights and potentiality for interpolation to visualize the smallest details. For big volumes all these features can be somewhat heavy to be used interactively. However, the interpolated volumes can be visualized smoothly by generating high quality animations in jpeg-format around e.g. the tilting axis. The animations are run by JPEGANIM that shows the jpeg-images produced in sequence and in stereo. The animations can further be interactively magnified, moved to different regions and details can be measured with scales at high accuracy. FUNCS can produce animations also with the analogy colors (red-green or -blue) for machine independent stereo-viewing . We use the JPEGANIM program also for visualization of the original tilt-series after the alignment procedure. With the animations we do not only judge the quality of the alignment but also of the 3D-reconstruction as the original EM-tilt-series can be visualized successively in stereo at high magnification as earlier reported . It is common nowadays to obtain a hard copy of a picture using a computer. Given a three dimensional model, obtaining the corresponding physical realization is, usually, very difficult or even impossible. The geometrical complexity, for instance, in 3D-reconstructions of chromosomes is impossible to reproduce using conventional manufacturing technologies such as numerically controlled milling machines. Recent technological developments, though, have made it possible to manufacture physical objects of arbitrary complexity in mere hours . These new manufacturing processes are commonly referred to as "Rapid Prototyping Technologies, RPT for short. A physical model can overcome some of the shortcomings of computer generated images. Using this new technology, we have manufactured a 3D-solid model of a reconstructed chromosome. The reconstruction of the chromosome had to be converted to a suitable representation. It was required, among other things, that the various parts of the chromosome had to be attached by solid bars in order to maintain their spatial relationship. The manufacturing took place at SINTEF-SI (Norway) using a SOLIDER 5600. We are also planning to manufacture a solid 3D-model of a reconstructed virus. We have made several reconstructions of eukaryotic chromosomes that include metaphase chromosomes of a human cancer cell line (HeLa) and Chinese hamster ovary (CHO) cells. Metaphase chromosomes are isolated according to cytogenetical methods modified for electron microscopy [6, 12]. The electron microscopy preparation contains about 80-90% of pure metaphase chromosomes. 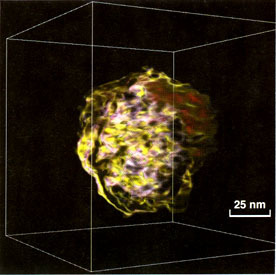 A necessary amount and size (5, 10, 15 or 40 nm) of fiducial-gold-markers are usually included before chromosomes are applied to plastic-coated-Ni-grids. We take picture-tilt-series of whole-mounted chromosomes with increments of 3 degree from 0 to + 60 degrees at 7000-20000x magnification. At higher magnification e.g. 100000x, the chromatin fibers of whole-mounted chromosomes are severely degraded by radiation before the series is completed. As mentioned earlier, only automation can effectively solve the problem. The higher order folding of the DNA is an ultimate problem in eukaryotic chromosome research. Nucleus of e.g. a human cell contains about 2 m of 2.5-nm-thick DNA which in metaphase is divided into 46 chromosomes with a total length of about 200 mm i.e. a packing ratio of 1:104. It has been clarified that the first order of packing is an 11-nm thick string of nucleosomes. In this "beads-on-a-string" form of the chromatin, the DNA is wound 2 times around each nucleosome composed of histone proteins. The second order packing of the nucleosomes into 30 nm-chromatin fibers, which are the fibers usually seen in EM-preparations of nuclei and metaphase chromosomes, has been a controversial problem . Electron tomography has also been used in these studies . The packing of DNA into 30-nm fibers gives a packing ratio of 1:40; there is, however, still a higher order packing of 1:250 to reach the metaphase level. The higher-order-folding of the 30-nm chromatin fiber in metaphase chromosomes and in interphase nuclei has been a central topic in electron tomography . Suitable preparative conditions are also not agreed on . Because of some unknown reason, specially the chromosome-coiling is difficult to preserve with conventional EM-preparative techniques [6, 13]. The preparative methods we have used  preserves the higher order structure of chromosomes e.g. chromosome coiling as well as the 30-nm chromatin fibers as shown in our 3D-reconstructions of chromosomes (Fig. 1). Though, it is clear from our reconstructions that the folding of the 30-nm fiber is much too complicated in eukaryotic chromosomes to be easily followed in 3D. A solution to this problem could be through some algorithm that could possibly resolve or track the folding; though earlier efforts have been less prosperous . In this respect a better solution to the problem can presumably be found from e.g. yeast chromosomes where the amount of DNA per chromosome is much smaller. Enzymatic digestion with DNase reveals a scaffolding structure of the chromosomes  (for earlier references see  ). The 3D-Reconstruction of the chromosome scaffold shows a complicated structure (Fig. 2). DNA-fluorescence cannot be detected with any DNA-sensitive fluorochromes e.g. DAPI in the DNase-digested chromosomes. Nevertheless, ordinary (Fig. 1) and control preparations show bright DNA-staining. The spiral structure of chromosomes i.e. chromosome coiling is often believed to be due to condensation of chromatin fibers . We can further show in the 3D-reconstruction that the spiral structure is clearly maintained in DNA-depleted chromosomes and rather due to the innate structure of the scaffolding elements (for more details see  ). The coiled structure of the chromosome scaffold is also very evident in the 3D-solid-model (Fig. 3). It is also clear in the solid model that in stretched regions, close to the centromere, we can distinguish a 30-nm thick scaffolding-fiber that seems to coil into 100-150 nm in diameter macro-coils or regularly arranged rings as earlier suggested . In favorable situations e.g. the stretched region, the scaffolding fiber seems also to reveal 30-nm thick particles [6, 12, 14]. Uukuniemi virus (Bunyaviridae): A spherical, enveloped i.e. membrane bound virus (90-100 nm in diameter) with an inner core i.e. capsid of three 2-3 nm thick coiled, possibly helical, circular nucleoproteins. The genome consists of three segments of single-stranded (ss) RNA molecules of negative sense. The envelope is characterized by glycoprotein knobs (10-12 nm in diameter) attached to the surface of the lipid membrane. These are revealed with negative staining or by freeze-etching techniques . Rota virus (Reoviridae): 3D reconstructions of rotavirus particles in cryo-electron-microscopy have revealed the structure at 4 nm . Icosahedral, non-enveloped, double-shelled virions (outer 75-80 nm, inner 45 nm in diameter). The genome consists of eleven double stranded (ds) RNA segments. Both shells are composed of a single polypeptide arranged in an icosahedral T= 13 arrangement (780 subunits). Sixty spike-like protrusions extend from the inner shell through the outer one. HIV, human immunodeficiency virus (Retroviridae): Spherical, enveloped i.e. 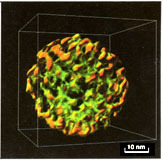 membrane bound particles (100-130 nm i diameter). The genome consists of two (diploid) identical ss-RNA strands (plus t-RNA from the host). As seen by thin-sectioning-techniques, the envelope of immature virions is lined with a 20-25 nm thick submembraneous layer of precursor (gag) proteins and the central area looks empty. Mature virions have in the center a characteristic conical core consisting of the viral RNA complexed with viral protein and the submembraneous layer is very thin. Platina-carbon shadowing techniques have revealed globular knobs (12-14 nm in diameter and 10 nm high) formed by clusters of glycoproteins. The knobs have the tendency to come off; believed to make the viruses more resistant to immunological attacks. However, the knobs are also sensitive to preparative conditions. They are not easily distinguished e.g. in thin sections. In negative-staining with uranyl acetate, merely triangular shaped protrusions are detectable, interpreted that the lower part of the knobs is triangular while the top is globular and covered by stain i.e. making them less visible . Our first reconstructions of early and late budding Uukuniemi virus were done from sectioned material and showed truncated i.e. half viruses indicating the inconvenience of using sections. Also tilt-series of negatively stained whole-mounted Uukuniemi virus and rotavirus resulted in collapsed i.e. 50% flattened reconstructions. A rather successful reconstruction of an Uukuniemi virus could be obtained by staining the virus briefly with uranyl acetate in methanol and sublimation from solidified t-butanol (Fig. 4). The tomography could be determined by low-pass filtering down to 3 nm. The shape of the reconstructed virus (71 nm i diameter) was well preserved. Inside the particle we can also vaguely detect domains of 4 nm thick coiled strands, which could represent the core of nucleoproteins. However, the pattern of knobs on the envelope was less apparent compared to ordinary negative-staining. These discrepancies of earlier techniques obligated us to develop new preservation methods which can be used for electron tomography of whole-mounted viruses. Some new preparation methods emerged which we have tested on rotavirus as a model. Briefly, in the method we have combined uranyl acetate staining of glutaraldehyde-ruthenium-red fixed viruses with sublimation from the t-butanol. Ruthenium red, which shows and preserves carbohydrate moieties (for references see ) usually in combination with osmium tetraoxid, seem to also retain the uranyl acetate stain as control preparations without ruthenium red appear to have lost the positive uranyl acetate staining. The shape of the rotavirus is well preserved (Fig. 5) together with the pattern of protrusions in the shell that usually can only be detected with negative-staining. According to our measurements from the tomography, the particle is probably representing a single-shelled rotavirion as it is not more than 42 nm in diameter. The burdock-like particle is formed by an inner core surrounded by numerous 8 nm long spikes with a 4 nm wide globular top part. The membrane wrapped HIV preparations was fixed in glutaraldehyde-ruthenium red, furthermore treated with a osmium-thiocarbohydrazide method  and briefly stained in uranyl acetate in methanol before sublimation from solidified t-butanol. Tomographies of HIV (Fig. 6) show an enveloped virus of 86 nm in diameter. Inside the envelope material is found which is not fully developed to a typical conical shape, distinctive of mature HIV particles. We have observed, that the diameters of the reconstructed viruses, but not their subunits, are smaller than have been reported by others [15-17]. This could be due to that our results are based on veritable preservation of the 3D-shape of the particles and measurements in 3D as our electron tomography realizes. Reconstruction of whole animal cells (about 10-30 mm in diameter) must be done from serial sections as cells are too thick for ordinary 100 kV electron microscopes, which can only use sections not thicker than about 0.2 mm. This will result in some 100 sections. For a 400 kV electron microscope the sections can be 3 mm thick, which would result in not more than about 10 sections. As the information is in the sections, a reconstruction of every section has to be completed separately, with the necessary resolution needed, and merged into a complete cell. Perhaps, before the end of the century, we can experience when some bionauts, ready with 3D-helmets, -gloves, -cameras and other additional outfits, are entering the virtual world where a first complete reconstruction of an entire eukaryotic cell is floating. The reconstructed cell has been aligned from several serial sections, each of which has been separately reconstructed at high resolution. The whole reconstruction consists of a package of several terabytes of voxels. All other activities for the computer have been shut off for several hours so the computer can load the reconstructed volume. The first voyage into an animal cell can begin. The scenario can take place at CSC, who knows? Frank J, ed. Electron Tomography: Three-Dimensional Imaging with the Transmission Electron Microscope. New York: Plenum Press, 1992. Skoglund U and Daneholt, B. Electron microscope tomography. TIBS 1986;11: 499-503. Takayama S and Hiramatsu H. Scanning electron microscopy of centromeric region of L-cell chromosomes after treatment with Hoechst 33258 combined with 5-bromodeoxyuri dine. Chromosoma 1993; 102:227-232. Luther PK. Sample shrinkage and radiation. In: Frank J, ed. Electron Tomography: Three-Dimensional Imaging with the Transmission Electron Microscope. New York: Plenum Press, 1992: 39-60. Woodcock CL. The organization of chromosomes and chromatin. In: Frank J, ed. Electron Tomography: Three-Dimensional Imaging with the Transmission Electron Microscope. New York: Plenum Press, 1992: 313-357. Engelhardt P. Higher Order Structure of Eukaryotic Chromosomes - Scaffolding elements and DNA folding (Doctoral Dissertation). University of Helsinki, 1988, ISBN 952-90032-1-8. Dierksen K Typke, D., Hegerl, R., Koster, A. J. and Baumeister, W. Towards auto matic electron tomography. Ultramicroscopy 1992; 40:71-87. Koster AJ Chen, H., Sedat, J. W., and Agard, D. A. Automated microscopy for electron tomography. Ultramicroscopy 1992; 46:207-27. Dierksen K Typke, D., Hegerl, R., and Baumeister, W. Towards automatic electron tomography II. Implementation of autofocus and low-dose procedures. Ultramicroscopy 1993; 49:109-120. Engelhardt P. 3D image processing of whole mounted chromosomes by computer animation from tilted serial electron microscopic projections. Conf. 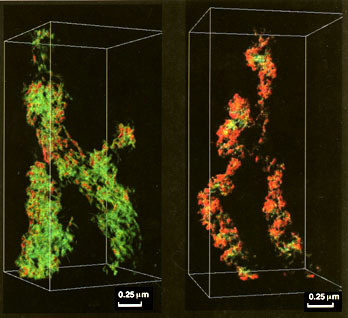 Proc: 3D Imaging Sciences in Microscopy. Amsterdam: The Society for 3-D Imaging Sciences in Microscopy, Amsterdam, 1992. Dolenc A. An overview of Rapid Prototyping Technologies in manufacturing. In: Technical Report TKO-B116, Helsinki University of Technology, April, 1994. Engelhardt P Ruokolainen, J., Dolenc, A., Öfverstedt, L-G., Mehlin, H. and Skoglund, U. 3D-reconstruction by electron tomography (EMT) of whole-mounted DNA-depleted metaphase chromosomes show scaffolding macro coils, 30-nm fibers and 30-nm particles. Conf. Proc: 3-D Image Processing in Microscopy. Munich: The Society for 3-D Imaging Sciences in Microscopy, Amsterdam, 1994. Ris H. Higher order structures in chromosomes. 9th International Congress on Electron Microscopy. Toronto: Microscopical Society of Canada, 1978: 545-556. Engelhardt P Plagens, U., Zbarsky, I. B., and Filatova, L. S. Granules 25-30 nm in di ameter: Basic constitutes of the nuclear matrix, chromosome scaffold, and nuclear envelope. Proc. Natl. Acad. Sci. U.S.A. 1982; 79:6937-6940. Petterson R and von Bonsdorff, C-H. Bunyaviridae. In: Nermut MV Steven, A. C., eds. Animal Virus Structure. Elsevier Science Publishers B. V. (Biomedical Division), 1987: 147-157. Prasad BVV Wang, G. J., Clerx, J. M. M., and Chiu, W. Three-dimensional structure of rotavirus. J. Mol. Biol. 1988;199:269-275. Nermut MV. Electron microscopy of human immunodeficiency virus. Microscopy and Analysis 1994; July(30): 13-15.